YOU ARE SIMPLY AMAZING. THANK YOU FOR BRINGING THIS SUBJECT TO LIGHT. YES, PEOPLE SHOULD BE PAID FOR THEIR TIME WHEN THEY REPRESENT A COMPANY IN MY OPINION. I TOTALLY AGREE WITH YOU. YOU ARE A CLASS ACT. I LOVE THE GALS YOU HAVE MAKING CLASS KITS. I WISH MORE PEOPLE WERE LIKE YOU. ALL THE BEST TO YOU AND YOUR AMAZING ADVOCATES. What a great idea Ellen, and kudos to you for realizing that as much as you'd like to, you can't do it ALL! (But you sure do a LOT! ); I don't think you could have picked 3 more talented enablers, ooops, ladies to work with! I know my 'stash' has grown since visiting their blogs became a regular thing! Congrats & Good luck to all of you! Best wishes on your new endevor. You selected a great team and I'm sure it will be a quality product. What a totally fabulous idea and what a dynamite team you have selected!!! This bracelet kit is gorgeous!!! Wonderful work, Debbie!!! Congrats to everyone and best wishes!!! What a fabulous idea! I can't wait to see what's ahead for a chance to get "taught" by the very best! Love your innovative idea! I'm sure it will be a great hit! I love to read your blog. I have to say I am a budget stamper, card maker, scrapbooker so I don't buy all the latest things in great quanitites "just because". I am actually someone who uses stuff instead of storing it! LOL I certainly do appreciate seeing what others with more means to buy supplies come up with. So much beauty and creativity! I am such a fan of your art and your company -- you are my go-to source for 'big' items like Copic markers and (should arrive any-day-now!) Spellbinder nestable dies. I know I can count on you to have done your homework, and that what I get from your store will be a quality product at a fair price. Thanks for always being so customer-oriented, and I look forward to what you'll bring us with the kits! I also think so much of each member of your new team! They are great artists and -- even more important -- seem like really nice people, too! Wonderful! What a terrific partnership, and as a customer, I am going to love this! Thanks and congratulations on the new aspect of your business! What an exciting concept. I am thrilled to see what you have in store for us. You as well as the three you have partnered with are some of my all time fav designers. I know that you will all be wildly sucessful in your new endeavor. Looking forward to seeing more. Ellen congratulations -- I think it's wonderful that you, Michelle, Debbie and Trudi have teamed up. I blog jump everyday to all of your blogs! Love the bracelet. Can you tell me the length of the bracelet? I just saw Debbie's bracelet over on her blog. What a great new product for your store. Wow! This is such a wonderful, forward-thinking endeavor you ladies have embarked upon. I congratulate you and wish you all much success! Now to head over to the store and buy my first kit!! You can't loose with business partners like that, I can't wait to see what you all come up with That bracelet is beautiful! This is a WONDERFUL idea, both for those of us who live far from the stamping opportunities I read about, and for the designers who have put their time and talents into a product. Ellen, I was so pleased with the class kit I purchased last winter from you to make Christmas ornaments. Now if you could just please define what a concept artist is! You are the greatest! THis is a wonderful idea and it really allows the designers to expand and showcase their talents! Fabulous idea, Ellen! 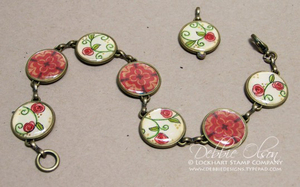 Love Debbie's bracelet and a great project for Christmas gifts! I love all three of the ladies you chose. They are excellent stampers/designers and will be in for some exciting projects, I'm sure!!! What a great idea! Can't wait to see all the different kits you come up with!! This one is quite stunning!!! Best of luck to you all! This is a wonderful idea and so much talent!